AoV1-173 Holy Holy Holy Lord (Ham) Simple chant. "Holy holy holy Lord; praise and honour are yours, for you alone are worthy to receive the glory and praise." Lyrics and electronic sound sample, and a great story in the comments on how this song came to be written. Iona (M&G, T1AU) / MV099 / GC(II)673 / G(3)763 / Lau996 Stand O Stand Firm (Cameroon) I love having an excuse to sing this simple and powerful song; didn't Elijah have to be pretty brave? Very easy for your congregation. You can make up cantor parts too “Oh my sisters…. Oh my brothers… Oh my children….” or you can name countries you are praying for in your intercessions. Good for kids. Scottish sound sample. Lead sheet. Recorded Music New Song (Audrey Assad) A lovely song about needing to find a new song to sing, and still praising God as well. Catchy. Youtube. *BUC Song Project Sing, Sing with me (Potter) A fun song for kids about being part of God's family. Good for kids. Tune In: We will sing a new song to the world (Brown) An energetic song about the gospel. Sound sample and lyrics. 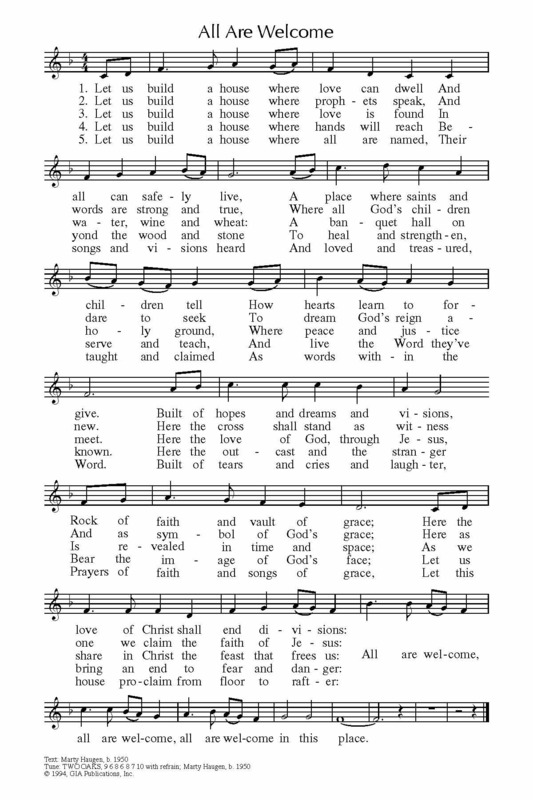 *PfAS096C Let the heavens rejoice (TenClay) A joyous Psalm refrain. Would work well on its own as an acclamation or call to worship as well. 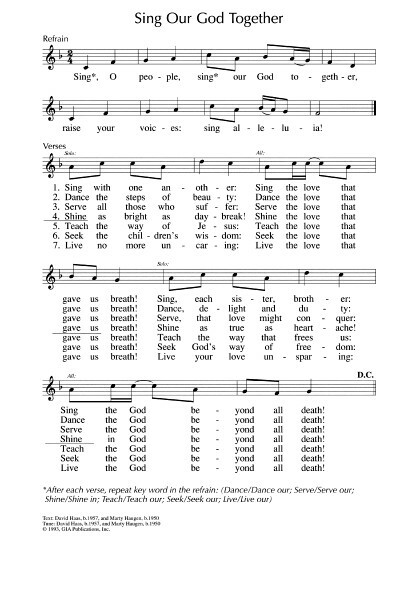 *PfAS096G Sing to the Lord no threadbare song (Daw) Just lovely words and a joyful 6/8 tune. "Sing to the Lord no threadbare song, no time-worn, toothless hymn!". I really quite like this one. PfAS096F Sing to the Lord a new song (Soper) Good simple and inclusive words to the familiar tune ES IST EIN ROS ENTRSPRUNGEN. Fairly plain, but good. New words to old tunes. *TiS 54 O praise the Lord all you nations (Willcock) Cantored version of the Psalm. TiS 704 / AoV2-090 / NCH760 / Iona (M&G) / CH824 / VU431 / WoV786 / ELW846 / SFFS 2067 / GtG598 / G(II)369 / GC536 / W&R741 / ZSS56 / URW398 / StF770 Amen We Praise Your Name O God / Siakudumisa (South African) A simple and popular Amen. Not wild about the GIA hymnals English version. Sheet music sample. A choral version, which is very nice, but not very gutsy. GC(II)521 / G(3)608 For your sun that brightens the day / We praise you (Haas) A nice joyful cantor and response. It's a bit more "praise and worshippy" than I normally like, but it's pretty good. Sheet music sample. Sound sample. TiS 166 / AHB 102 / GA398 / StB 35 Sing a new song sing a new song Excellent inclusive words from Australian poet James McAuley. The last verse annoys me a bit, but the rest is excellent. Lyrics. 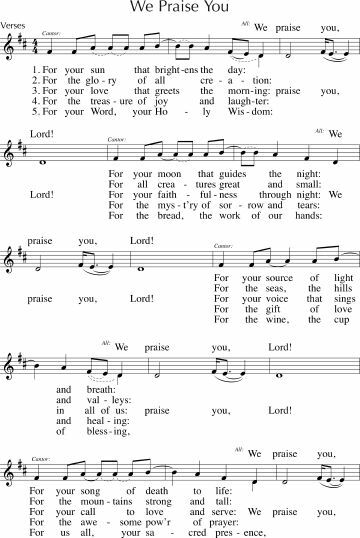 NCH009 / StJ / ELW791 / SFFS 2001 / CP523 We Sing to You O God (Proulx) Good hymny hymn with inclusive lyrics of praise. 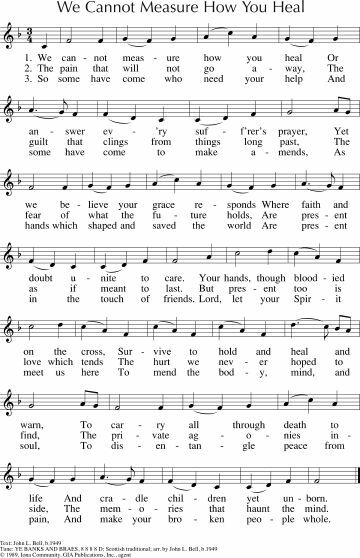 A good opening hymn. Nice descant part also. *AoV2-050 / GA412 / G(II)381 / GC523 Sing O People Sing Our God Together (Haas) Lovely energetic song. Works well as a call to worship; call and response verses. Lyrics and sheet music sample. Sound sample. *MV 180 Sing, Sing Out! Sing a new song (Hannah) An excellent two-part round. It’s worth teaching it to your congregation so they can sing it with confidence and break into two parts. Alternately, you could have a small group sing it in canon with the rest of the congregation. *Taizé / GC(II)533 Sing to God with joyful hearts / Singt dem Herrn (Berthier) A joyful round. Works well in English and German, and probably other languages too. Sound samples, sheet music and lyrics here. URW293 We Sing to You O God (Grindal) Good words to a standard hymn tune (DARWALL'S 148th). New words to old tunes. CH207 Grant now your blessing upon this offering (Tinio) Simple short song for receipt of the offering to a familiar tune (HALAD) that alludes to this Psalm. New words to old tunes. Solomon has built a house for God. Prays that all who pray “toward the house” be forgiven, fed, welcomed, healed including foreigners. Brunswick UCA Songs Take this space (Brown / Lees / McKinnon) This song was written for the opening of our renovated church space and it would be good to sing it again. *Taizé / GtG814 / CP563 / PfAS062D In God alone my soul can find rest and peace / Mon ame se repose (Berthier) A beautiful healing chant from Taize. Words and music and sound samples for learning the parts Good for kids. *Online Resource In my father's house (Somerville) A great new song, with an inspiring, and very singable chorus. Lyrics, sound sample, and source. *NCH387 / GtG361 / PH443 / GC(II)646 / RS782 / CP524 / Lau829 O Christ the great foundation (Lew) Excellent words of salvation and justice from Timothy Tingfang Lew, sung to the tune of "The church's one foundation" (AURELIA) which is in all standard hymnals. Lyrics There is a second possible tune (ABREU), which is more challenging. Note that the lyrics in the NCH are slightly different, and more inclusive. New words to old tunes. STB066 Joy found in Truth Will Set the World free (Korea) (Kim) John 8:32 Simple words of seeking and living by truth. Fairly simple tune, but will need to be taught. *MV031 Pure Love (Good) I think this song would be good for reflecting on truth. Very simple and beautiful. Good for kids. The faithful Centurion; Christ's mission extends to the Gentiles. CH348 / StS001 / LBW196 / ELW843 / G(3)625 / CP397 / W&R93 / SP304 / URW090 Praise the One Who Breaks the Darkness (Edwards) Good words of Christ's ministry to all. Can be sung to the familiar tune NETTLETON, or the less familiar and very lovely tune JOEL. Lyrics. New words to old tunes. Iona (Heaven Shall Not Wait) When our Lord walked the earth (Bell / PERSONET HODIE) Familiar and easy tune, excellent words. Chorus is “Power to speak and heal, grace to know what’s real, wisdom, insight and faith, grace and understanding” New words to old tunes. AoVK-28 / ATOK 376 Faith hope and love, this is what we long for (Watts) A groovy, easy, fun song. Good for kids. I'd love to hear your ideas, especially if you know of songs that I have not included. Please join the discussion by adding a comment below! how about "A Roman centurion sought out the Lord"
For Psalm 96 and Psalm 98 I like 'Sing a new song to the Lord'by Timothy Dudley-Smith, available in Mission Praise 599. I really like the tune, Onslow Square.